Are you far from home and missing Portuguese home cooking? Do you find yourself longing for a hearty 'sopa de legumes' – thick vegetable soup? Do you dream of 'porco alentejano' – a stew of pork with clams and small roast potato chunks? Or maybe you are yearning for 'caldeirada – a fish stew like bouillabaisse using up all the odd fish brought back in the nets by fishermen? Perhaps it's a creamy goat's milk cheese from Beira Baixa, the province between the Serra da Estrela and Spain, which pops into your mind, making you salivate with nostalgia? Well if you're in Britain now you might just be in luck. Remember the Portuguese custard tart that brought back memories of long past sunny days in Lisbon? (See Pasteis de nata for the story.) 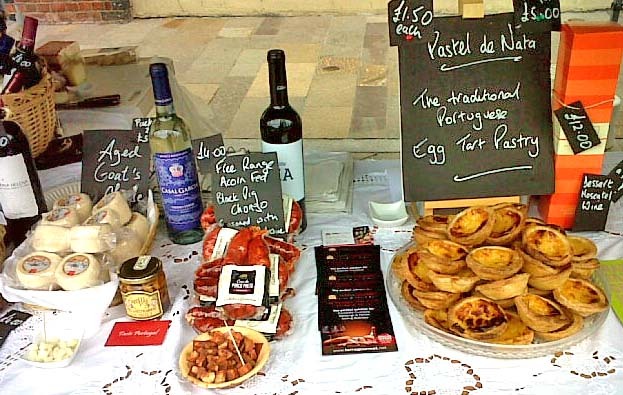 Well, I saw that tart together with Beira Baixan cheese and Casal Garcia 'vinho verde' - lightly sparkling young wine from the north of Portugal - in a corner of St Sampson's Square during York's annual food festival. It's not long since I was last in the Minho and I shall be there again soon as I know the plans of our house (see the archive for the story of our house near Ponte de Lima) are now with the local council for approval but all the same, standing there in the middle of my home city of York, I felt a sudden pang of nostalgia for some nourishing Portuguese peasant food. Don't feel insulted by the word peasant; as in France, good, frugal, sustaining food has always been cooked in the countryside for the people who are the backbone of Portugal. So, you may ask, where did this Portuguese feast come from? Step forward Adriano Carapeto. Sr Adriano previously of Loule but latterly of Liverpool is a man of many parts. After studying law in Lisbon, he spent five years in the army followed by a stint working in the department of investigation in the Criminal Police Force. After that he spent ten years as an estate agent with an office in Quinta do Lago in the Algarve. Two years ago, Sr Adriano and his partner Diane, who is from Liverpool, began to ask themselves why it was that the British friends who visited them in the Algarve would rave about Portuguese food but were unable to find it anywhere in England – with the possible exception of London. Needing a new challenge they decided that not only was entrepreneurialism the way of life for them but that the north of England was in dire need of a taste of Portugal. 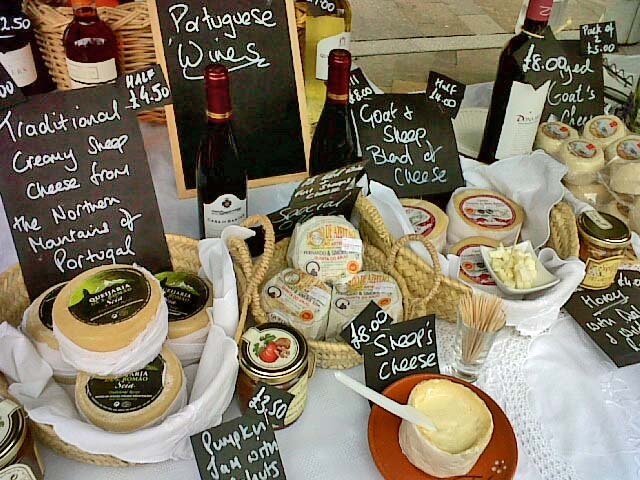 Unsupported by loans or investors they took to the road to try and interest people in their products and finally decided on selling through farmer's markets, food festivals and Christmas markets. 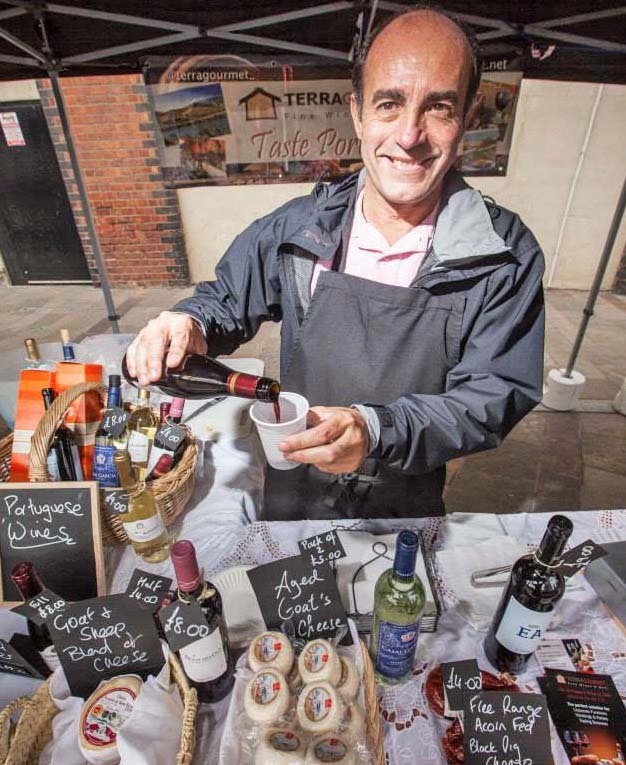 So if the weather is cold and dank and you are stuck in Britain while the summer holidays seem a long way away, why not 'matar saudades de Portugal' by visiting the Terragourmet stall when it comes to town? 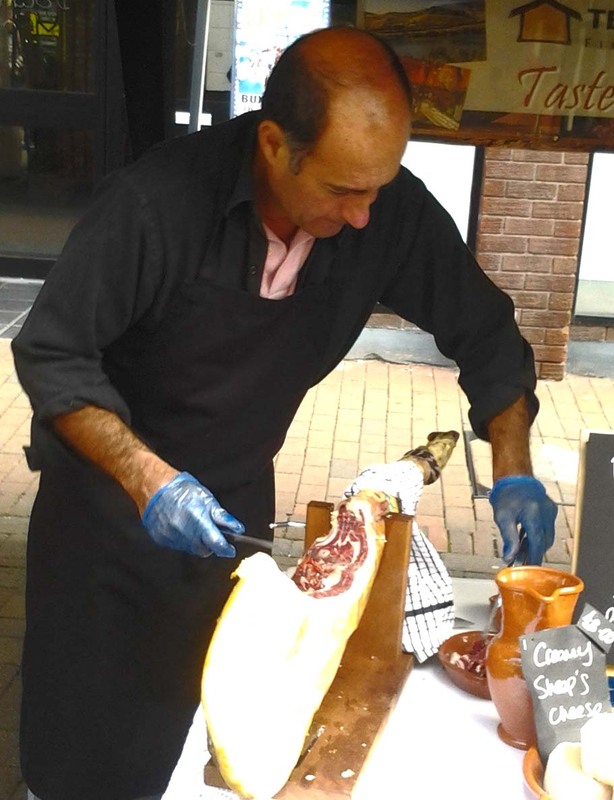 My husband for one is thrilled at the idea of being able to buy 'presunto' , the Portuguese equivalent of Parma ham, when we are here in Britain. He's addicted to it and lunch in Portugal is often crusty bread with presunto and cheese followed by fruit and coffee. What do you miss most about Portugal when you are away? Write in and tell us. I cheer myself up by making a Portuguese pork chorizo and bean stew...but yes, let me know when the stall is likely to re-appear.. I'm so happy you discovered this post. It's astounding to me how this lays simply under the surface, and when we at long last discover a word, an articulation, or a man that identifies with our emotions it is a blessing. I seek your work after your lords goes well and kindly do be in contact! I anticipate hearing anything you find.